Originally created back in 1964 by Ideal, Hands Down is one of those children’s games that have defied the odds and has remained relevant throughout the years. Over the years there have been around ten different versions of Hands Down released. While I can vaguely remember playing the game when I was young, I didn’t really remember the game that well. Since I generally like speed games I decided to give Hands Down a chance as there had to be some reason why the game has remained relevant for as long as it has. Hands Down is a simple speed game that can be fun at times but is really lacking in gameplay outside of the speed mechanics. Choose a player to be the dealer. Remove the blank card from the deck. Shuffle the rest of the cards and deal four to each player face down. The rest of the cards form the draw pile. The player to the left of the dealer starts the game. A player begins their turn by drawing one card from the draw pile (two cards if they have no cards in their hand currently). 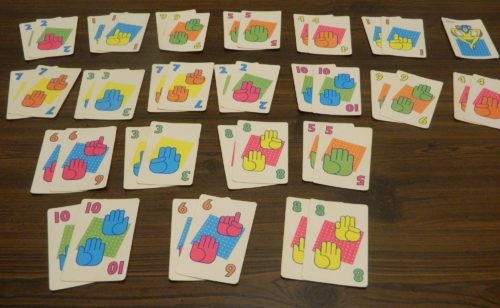 The player will then look at the cards in their hand. 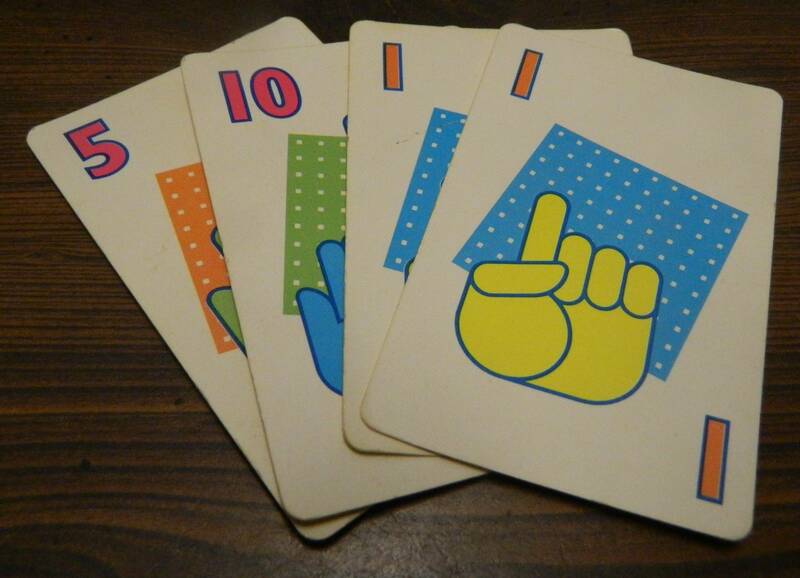 If they have a pair of cards of the same number in front of them they press down on their hand button. The joker does not match any of the other cards. This player has a pair of ones in their hand so they will be able to press down on their hand button. When the current player presses down on their hand, the other players press their hand button as quickly as they can. 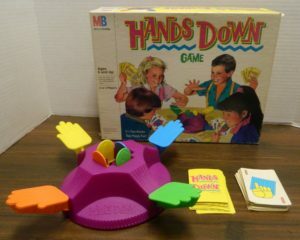 The last player to press their hand down loses. The current player plays their pair of cards in front of them. The current player will then randomly take one card from the player who lost. 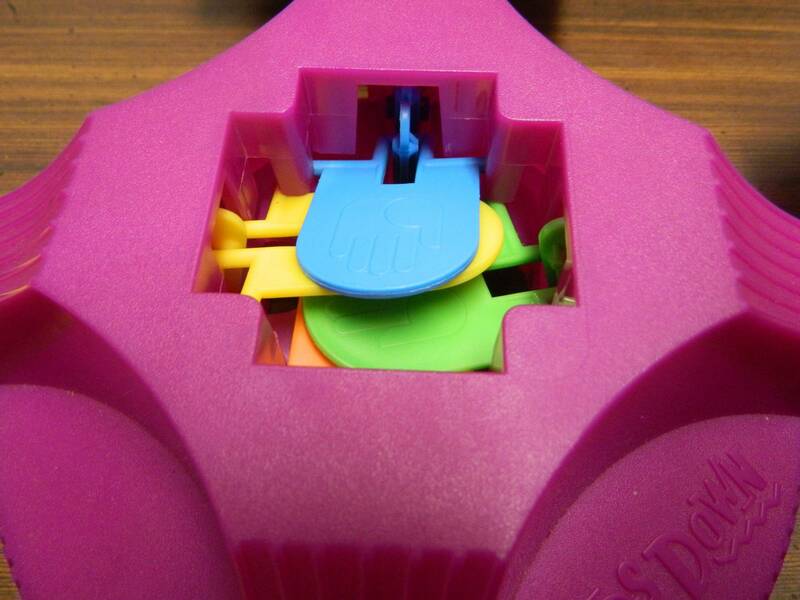 The blue player was the last player to press their hand. The current player will get to take one card from the blue player. The current player can then press their hand button if they have another pair. If the player has no pairs in their hand they can either pass their turn or they can fake having a pair. If the player passes, the next player takes their turn. If a player fakes having a pair they can pretend like they are going to press their hand button without actually touching it. If any players touch their hand buttons, they will lose one of their cards to the current player. When the draw pile runs out of cards, whenever a player has to draw a card(s) they will take the card(s) from one of the other players’ hands. The game ends when all but the joker card has been played in front of one of the players. Each player then calculates their score. Each pair that a player played is worth one point while the joker is worth two points. The player with the most points wins the game. If there is a tie, the tied players total the value of each pair (a pair of sixes is worth six points for example) with the joker being worth 20 points. The player with the highest total breaks the tie. The players have scored points as follows: 8 (6 pairs plus the joker), 7, 4, and 3. Since the top player has scored the most points they have won the game. The driving force behind Hands Down is the speed mechanic. When a player has a pair in their hand they can initiate the speed mechanic by pressing down on their hand button. Once a player presses down on their hand, all of the other players have to race to press down their hand as quickly as possible. The last player to press down on their hand will lose one of their cards to the current player. While this mechanic is really simple and basically your typical speed mechanic, it is actually still pretty fun. There is something satisfying about beating the other players by pressing your button first. Hands Down also has the added benefit of each player having their own button so you don’t have to worry about players hitting each others hands. 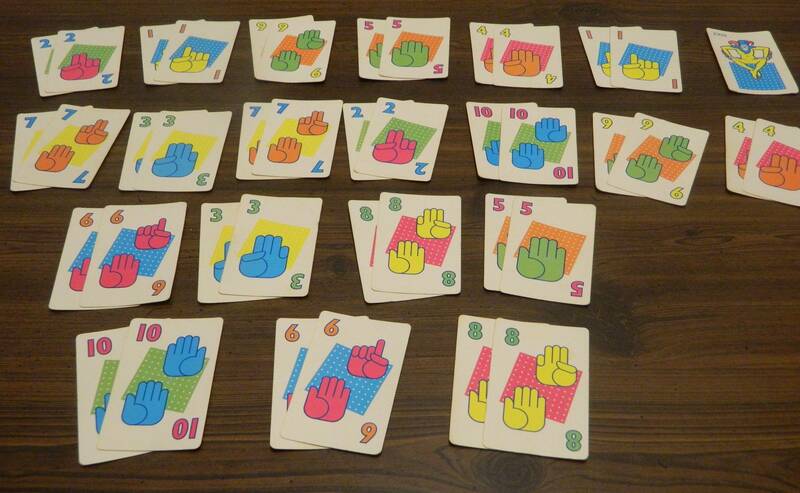 If you like speed games you should enjoy the speed aspect of Hands Down. One thing that helps the speed mechanic is the idea that players have the option of trying to fake a pair. Players have the option of simulating the motion of pressing their button without actually pressing it. If they are convincing enough they may be able to trick one or more players into pressing their buttons allowing the current player to take a card from each player that they were able to trick. This adds something to the speed element as it can act as a deterrent to overzealous players. A player can’t be too cautious or they will lose the face off but they also can’t be too aggressive or they can be tricked. The bluffs can occasionally be quite convincing but too often they don’t lead to anything. To be successful you can only bluff occasionally as if you regularly bluff the other players are unlikely to fall for them after a while. As a speed game Hands Down is going to be a game that some people are going to be better at than other people. People that struggle at speed games are going to have a hard time winning Hands Down. If you regularly lose the face offs you are going to keep losing cards which is going to make it hard to form pairs. In addition to having next to no chance of winning the game, you probably don’t want to play the game with someone that is significantly worse at speed games than the other players. You generally want to play with people around the same skill level otherwise the worst player will lose most of the faceoffs making the speed mechanic not as interesting as it could have been. The problem is that outside of the speed mechanic there isn’t much to the game. There is a light set collection mechanic but it doesn’t play a large role in the game. This is because there is next to no strategy in the game. You draw cards and hope that you get cards that help you complete a pair. As you are randomly drawing cards there is no strategy that can help you get more pairs in the game. The only way to improve your odds in the game is to trick players into hitting their hand early. Since it doesn’t seem to be that easy to trick the other players, you don’t have a lot of control over your fate in the game. You won’t be able to win the game if you are terrible at the speed element. If you are on par with the other players in the speed element though, you have to rely on luck being on your side if you want to win. As far as Hands Down’s length I can see it as both a negative and a positive. Unless the players get really unlucky I see most games only taking around 10-15 minutes to complete. Hands Down only has 41 game cards so the game ends after only 20 pairs have been formed. This generally doesn’t take long unless players keep taking cards from one another which prevent players from completing pairs. On the positive side the game’s short length will make Hands Down work well as a filler game and it will hold children’s attention. On the negative side the game seems to end as soon as it begins. I think the game should have come with a second set of cards so players could have chosen to use both in order to make the game longer. I guess you could always purchase two copies of the game to get two decks but I don’t know why the game couldn’t have originally came with two decks. As there have been several different versions of Hands Down made over the years, the component quality is going to depend on the version of the game. 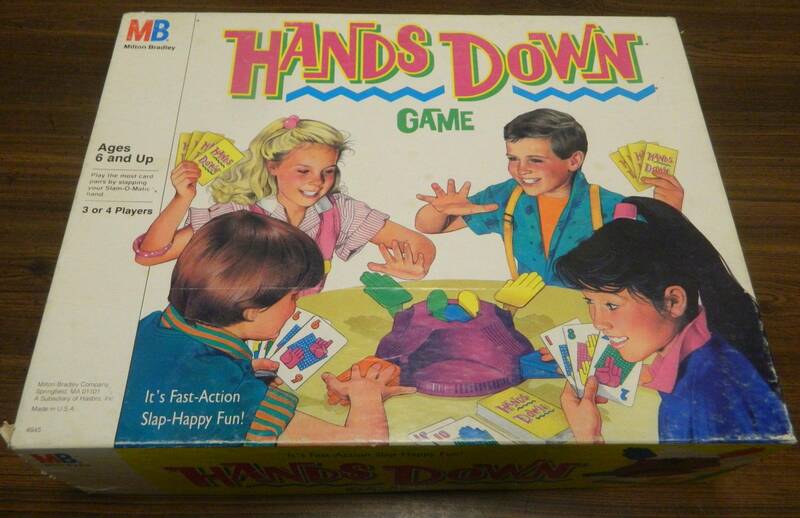 For this review I used the 1987 version of Hands Down. There are some things that I liked and disliked about Hands Down’s components. The gameboard works pretty well and it lets players avoid slapping one another. When two players hit their buttons at around the same time though, the hands tend to get stuck together and it takes a while to get them untangled. The cards are nothing special as the artwork is kind of bland and the cards are kind of thin. Unless you take really good care of the game the cards will get creased. Should You Buy Hands Down? Hands Down is a game that has remained relevant since its introduction in 1964. The premise of the game is really simple: gather pairs of cards and don’t be the last player to press down your hand button. While the speed mechanic is pretty simple and generic, it is still pretty fun. There is just something satisfying about racing the other players to press your button before they are able to. With the added ability to bluff the other players, people who enjoy speed games should enjoy the speed element of Hands Down. The problem is that outside of the speed mechanic there isn’t much to Hands Down. There is a light set collection mechanic but it relies almost entirely on luck. If you are at least decent at the speed element, the player who is dealt the most pairs is going to win the game. At the end of the day Hands Down is neither a good or terrible game. If you don’t really care for speed games, Hands Down has nothing to offer you. If you like speed games, Hands Down is a fine game even though there are better speed games out there. If you like speed games and you can find Hands Down for cheap it may be worth picking up. It is surprisingly fun to press your hand button down before the other players. Is simple and accessible enough that almost anyone can play. Outside of the speed mechanics the game relies entirely on luck.